This easy to make granola is wonderfully crunchy and delicious. To make this coeliac friendly, use gluten free oats and replace the wheat germ with ground flaxseeds. Preheat the oven to 140oC/gas mark 1. Mix the oats, pumpkin seeds, desiccated coconut, flaked almonds and a pinch of salt together in a large bowl. Put the sunflower oil, maple syrup and vanilla in a seperate bowl and mix until evenly combined. Pour the wet mixture into the bowl of dry ingredients and mix throughly. Spread out in a thin even layer on two large baking trays, then bake in the oven for about 1 hour. We recommend checking the granola after 40 minutes, though, as ovens vary greatly. You can bake it longer if you prefer more of a crunch, but no more than 10 extra minutes, as you don't want the granola to burn! While your granola is baking, put your raisins and dried fruit in a bowl and add the wheat germ. Once the granola is baked, leave it to cool on the tray for 20 minutes, then transfer to a clean mixing bowl and stir in the raisins, goji berries and wheat germ. 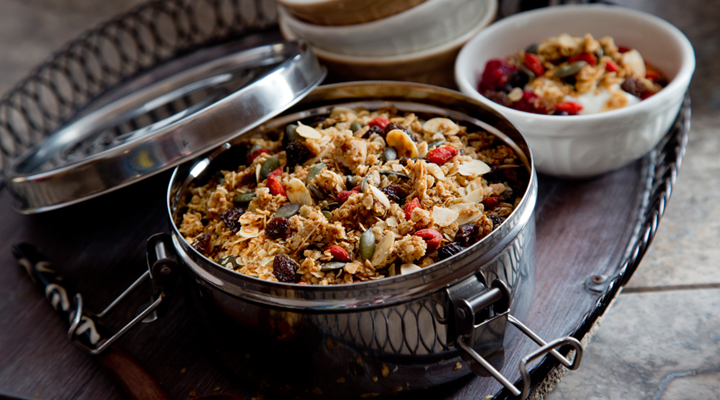 Once it has completely cooled, store the granola in an airtight jar or container to keep the lovely crunchiness. Serve with milk or yogurt or have on its own as a healthy snack throughout the day.